We are arguably heading into a radical period of change, our cities need to and are adapting to quickly evolving social, density and environmental pressures. We have compiled a list of architectural designs that are flagged to shape our future and aid a 'softer landing'. 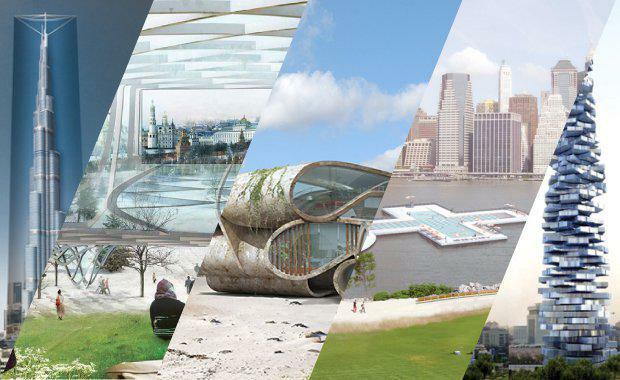 Take look at what our future might look like, from natural disaster proof fortresses and floating pools to underground communal spaces and breathing metal facades. Image courtesy of Dynamic ArchitectureIn 2008, David Fisher of Dynamic Architecture proposed a design for the second tallest building in Dubai that will have more than heads turning. ‘Dynamic Tower’ is an 80-storey computerised skyscraper, with each level having the ability to rotate 360 degrees around the central core independently of the others, giving the residents a choice of view and the tower an ever-morphing silhouette. The design employs solar cells on the top surface of every floor and wind turbines between each level that will harvest enough energy for the tower to power itself. Fisher plans to have the entire 420 metre structure assembled from prefabricated parts made in a factory in southern Italy. Image courtesy of Diller Scofidio + Renfro with Hargreaves Associates and CitymakersIn November of 2013, Zaryadye Park was announced by Strelka Institute as the winner of a two-stage international competition to design Moscow's first public park in over 50 years. Diller Scofidio + Renfro in collaboration with Hargreaves Associates and Citymakers, designed the indoor park on their theory of “wild urbanism” whereby a new landscape is shaped by the cohabitation of the natural and built environments. The 13 acre park located in the city centre will integrate four Russia-specific artificial landscape typographies - tundra, steppe, forest and wetland. Temperature regulation, controlled wind and simulated daylight will support the augmented micro-climates, meaning the park will be able to function through Russia’s harsh winters and be enjoyable all year round. With architecture becoming more awe-inspiring (just check out New York’s Khaleesi building) Architects need to work harder to stand out. That said, it is hard to tell whether US firm GDS Architects’ invisible design for South Korea’s ‘Infinity Tower’ goes with or against the status-quo. The proposed 450 metre tower is encased in reflective glass and LED screens. “Invisibility” is achieved through the use of several cameras positioned around the building that feed real-time images to the LED screens which are reflected onto the glass. A computer bends the images to counter the shape of the building in order to seamlessly blend in with the surroundings, thus creating the illusion of invisibility. Image courtesy of Plus PoolFamily and PlayLab’s design project for New York is set to create a pristine 164-foot long ‘+’ shape floating pool between Manhattan and Brooklyn. The designers saw an opportunity when they realised that New Yorkers currently do not use the river recreationally. The structure, dubbed ‘+ POOL’ will implement a giant filtration system able to purify up to half a million gallons of river water per day. In April 2014 a smaller-scaled trial to test the filtration system was floated at Pier 40 at Hudson River Park. Construction for the real thing is slated for this year. Image courtesy of Yusto / Giner GalleryThis strange, futuristic home looks like something out of a Tom Cruise sci-fi movie, however it is actually the work of Artists Dionisio González for his series “Dauphin Island”. Inspired by the severe weather that afflicts his home-town, Dauphin Island, Alabama, the hypothetical forts are crafted from concrete and iron to create a structure strong enough to withstand the frequent severe hurricanes that wash away the coastline and houses, causing the residents of Dauphin Island to rebuild time-and-time-again. Image courtesy of OP-ENIn 2014 think tank OP-EN put forward Project EXO-BURJ, an experimental idea to cover Dubai’s Burj Khalifa, the current world’s tallest building in a semi-transparent, reflective sheath. The casing would literally reflect the expansive urban backdrop of Dubai and fuse it with the form of the semi-visible skyscraper. OP-EN explains that the proposal aims to create “a fluid urban ambience” and show the viewer a new perspective of the city. Image courtesy of RaadWhile the current trend to deal with diminishing land seems to be building upwards, James Ramsey, owner of Raad Studio and Dan Bartsch might have figured out how to bring life underground. The project coined “The Lowline” aims to repurpose the former underground Williamsburg trolley terminal in the heart of the Lower East Side into a much needed green communal space. The difficulty with underground spaces is accessing sunlight. Ramsey and Bartsch solved this by inventing a “remote skylight” that uses fibre optics to concentrate sunlight from the surface, which is then transported underground and redistributed by a solar distributor dish in the ceiling. The technology allows for photosynthesis underground and also creates natural lighting without harmful UV rays. The Lowline is scheduled for completion in 2020. Image courtesy of The LivingThe "Hy-Fi” designed by David Benjamin, is an entirely organic compostable structure that is providing the foundations for carbon neutral, temporary structures. The circular tower of reflective and organic bricks was the winning design in the Young Architects Program’s (YAP) 15th edition, selected by Museum of Modern Art and MoMA PS1. The tower’s construction uses organic bricks manufactured by Evocative, comprised of corn stalks and fungi. The bricks are grown in trays developed by 3M that are then repurposed to serve as the reflective bricks within the structure. It is the first large scale, entirely compostable design to claim near-zero carbon emissions. Doris Kim Sung of DO|SU Studio Architecture’s ‘Bloom’ is a metal outdoor instillation featuring a feather-like deign that independently curls and unfurls based on the outside temperatures. The material utilises a fusion of two different metals that expand and contract at different rates, causing a tension that produces a curling effect when the sun heats the surface. This means that when the day gets hotter, the material curls, allowing for greater airflow. When the temperature cools, the material unfurls, reducing airflow and providing insulation. Swiss Architects Michael Hansmeyer and Benjamin Dillenburger introduced the concept with their project “Digital Grotesque” where an entire 16-square-meter room was adorned with intricate features created from 11 tons of 3D printed sandstone. The process of 3D printing interiors allows for intricate and futuristic interiors to be easily produced offsite, delivered then assembled with minimal labour. Printing for “Digital Grotesque” took one month and only one day to assemble. Hansmeyer says that the process lifts limitations on design as the CAD software allows for more detail than hand-drawing. SEE ALSO: Is This The Freakiest Building Ever? Image courtsey of Cambridge UniversityResearchers at Cambridge University have presented conceptual plans for an 80-storey wooden tower dubbed “Oakwood Tower”. The mixed-use building would claim the title of London’s second tallest building and be integrated within the Barbican. The venture between the University’s Department of Architecture, PLP Architecture and engineers Smith and Wallwork focuses on the value of timber as renewable resource. Battling an increasing population and densifying city, the natural material is believed to create more attractive and inviting living conditions, as opposed to concrete and steel. New discoveries in wood reinforcements, specifically cross-lamented timber, has made wood a viable material for tall buildings. The “new” hybrid timber is stronger and more fire-resistant than traditional wood. Image courtesy of Arup40 percent of the world’s total energy consumption comes from buildings, so it is no wonder that the architecture industry is displaying a trend towards the use of bio-materials. Not only is it responsible design, it also looks pretty cool. A joint venture between a group of designers from Splitterwerk Architects and Arup (the firm responsible for London’s “Sky Pool”) developed a bio-facade dubbed “SolarLeaf” that uses algae within glass panels on the building’s exterior to create renewable energy from sunlight. The first implementation of the technology was seen in 2013 on the BIQ house in Hamburg, Germany. Described by Arup as a “passive-energy house”, the microscopic algae convert sunlight into heat through photosynthesis, which is used to heat the building and the hot water supply. The algae simultaneously acts as a sun screen, providing internal shade and insulation. Image courtesy of Studio Marco VermeulenThe gas receiving station for the Agro & Food Cluster (AFC) in New Prinsenland, Netherlands features the world’s first recognised bio-facade. Designed by Studio Marco Vermeulen and developed by NPSP Composites in Haarlem, panels made from a unique bio-resin material called “Nabasco” encase the building. The bio-resin consists of hemp fibres and biomass residues sourced from the waste products of horticulture and agricultural practices, including waste from the nearby sugar factory. The Nabasco panels are constructed in moulds, meaning that embellished facades can be easily achieved. Each of the 104 panels on the AFC station is embossed with the letters representative of the elements that make up the chemical composition of natural gas. These honeycomb structures were designed by architects at Aedas as an add-on to the Al Bahr towers to help cool the buildings. The towers located in the harsh climates of the Abu Dhabi desert, were built with an entirely glass exterior making them vulnerable to heat and guzzling energy to power the internal air conditioning. The computerised multidimensional rosettes help to cool the building by contracting and expanding in response to the outside temperature, creating shade and cooling in the hottest parts of the day and completely closing up at night to provide insulation. The design claims to achieve a 50% reduction in energy consumption and an 80% reduction in solar gain. Image courtesy of Sean GodsellThe exterior of Melbourne’s RMIT design hub is covered with thousands of small sandblasted glass discs - a move by Sean Godsell Architects, a finalist in the Victorian Architecture Awards. The facade provides shade to the building, fresh air-flow, evaporative cooling and houses photovoltaic cells to gather solar energy. Each disc is affixed to a central rod that, based on the building’s internal temperature and humidity levels, automatically pivots to allow for or block the flow of air through the building. RELATED: What Is The Potential Of Operable Architecture? Image courtesy of Elegant EmbellishmentsA facade on the Torre de Especialidades hospital in Mexico City is helping to clean up the world’s most polluted city by eating pollutants. It received the facelift as part of a $20 billion initiative by the government to improve the city’s health infrastructure. The hospital is cased in a 300-foot long connection of modules designed by German company Elegant Embellishments. The facade utilises a paint developed by chemical company Alcoa, containing titanium dioxide, which is activated by ambient daylight to release free radicals that destroy pollutants. As air passes through the ‘mouths’ in the facade, the free radicals eliminate pollutants, allowing only clean air to pass to the inside. The lotus-pod-like design slows and distributes pollutants over its surface for more effective cleaning. The facade also provides shade and cooling by partially blocking sunlight entering the building.